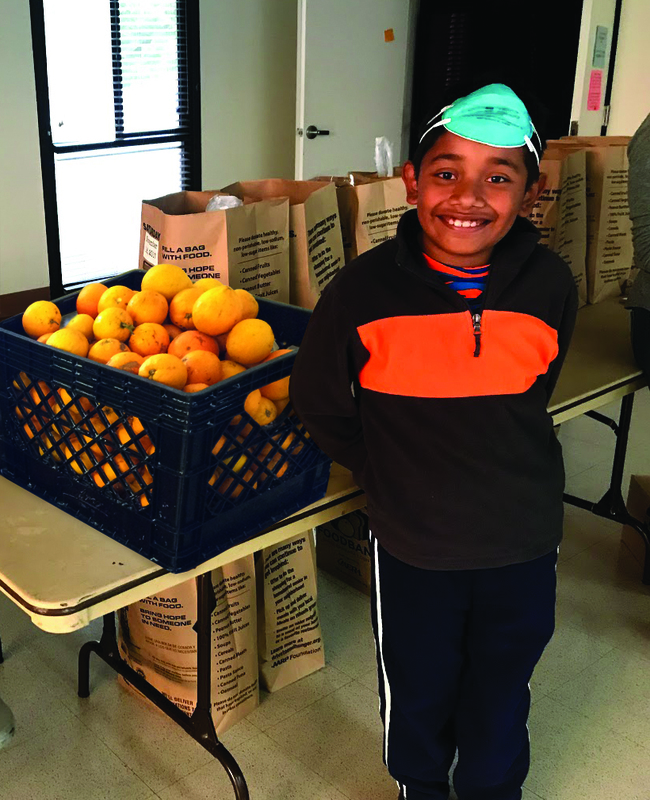 The Foodbank trains for our disaster role on a regular basis, but now we’re working harder than ever to ensure a healthy and resilient Santa Barbara County. Create a Disaster Food Box program to help individuals ans households be prepared and be more resilient if access to food becomes limited. Making capital investments in new vehicles to improve our ability to deliver food. Host a Disaster Preparedness Summit to train and strengthen communication and collaboration among out 300+ member agencies in the event of an emergency. Recruiting and training a new volunteer force that can be utilized for emergency food distributions when our scheduled distributions are unable to function. Expanding existing education programs and launching new initiatives in food literacy to strengthen community resilience in disaster. The skills training will teach people how to maintain a nutritious diet even with a very limited resources. These steps will help us keep the community fed and healthy in times of crisis. This is your Foodbank and we are ready to offer assistance. 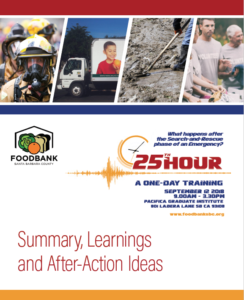 Read a summary of our learnings and discussions from our 25th Hour Disaster Preparedness Conference in the White Paper now. You can help us make Santa Barbara County more resilient and prepared! At the Foodbank, $1 = 8 meals. How? Volume purchase, grocery rescue, grower and retailer donations, gleaning local orchards and private gardens, national and statewide networks of foodbanks. Your monetary donation goes the furthest toward meeting evolving needs. Volunteer opportunities include food sorting and bagging, staffing distribution sites or event tables, gleaning fresh fruit and vegetables from local orchards and gardens, and more! Each one of our new disaster preparedness boxes contain food and gear for one person, for one week, as well as useful emergency tools. 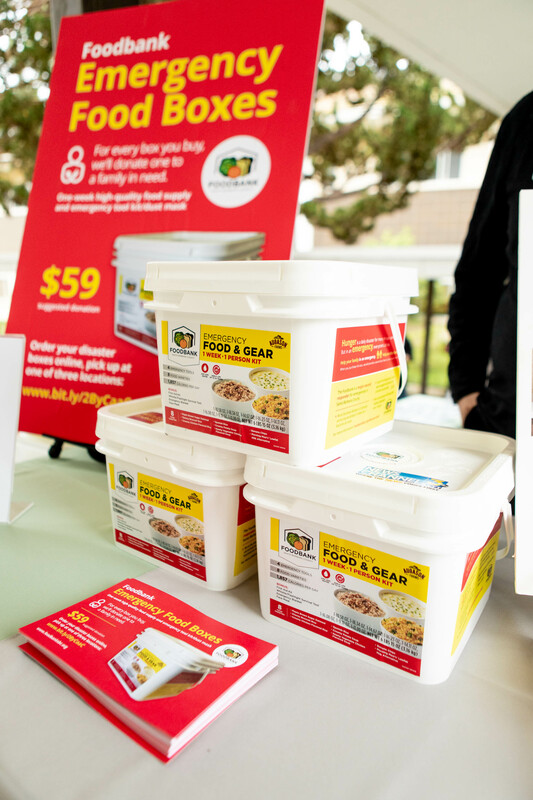 By purchasing one of these boxes, you are not only ensuring that you and your family are prepared in the event of a disaster, you are also giving hope to a family in need. For each box purchased, we will provide a second box, free of charge, to a low-income family. The Foodbank uses refrigerated trucks to safely store and distribute temperature-sensitive food. Our existing fleet of trucks is aging and needs to be replaced over the next few years to meet new state emissions standards and to ensure we can continue to transport food whenever necessary. Women’s Fund of Santa Barbara has generously given us a grant that will pay 80% of the cost of a new Hino refrigerated box truck outfitted with a lift gate, donation tracking software and GPS system. The larger truck will be able to transport increased food donations and also provide additional refrigerated storage, reducing the amount of spoiled food that might otherwise go to landfill which helps the program remain sustainable and responsible. In the wake of the Thomas Fire and 1/9 Debris Flow in Montecito, the Foodbank of Santa Barbara has mobilized its key local partners and member agencies to explore how to more effectively plan and collaborate to keep essential, life-saving services available during an emergency in this one-day conference. Guests participated in exercises, workshops, and trainings on topics like mass-care, media and client communication, and volunteer management. Stay tuned for learning results to be shared with the public via video and a white paper soon. We are the fiscal sponsors for VOAD-SBC (Volunteer Organizations Assisting in Disaster in Santa Barbara County) which works closely with the Santa Barbara County Office of Emergency Management to ensure agencies coordinate their emergency response efforts in the most effective way. 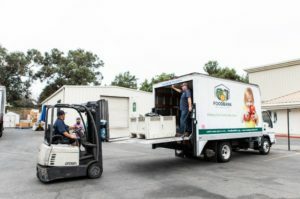 As the lead organization of VOAD-SBC, the Foodbank is responsible for leading disaster response efforts when any disaster strikes within Santa Barbara County. If you’d like read more about the recent events that reinvigorated our efforts to strengthen our disaster preparedness and relief efforts, please click here. The Foodbank is part of VOAD (Voluntary Organizations Active in Disaster), serving as the fiscal agent and leader. During a disaster, the Foodbank is prepared to respond with food and necessary water for those that become displaced. Please visit the VOAD website for more information: sbcvoad.org. Earthquakes, fire, flood or other disasters require immediate response. Planning ahead and practicing your response will help you react quickly. Planning ahead includes taking some time to collect emergency contact information, family medical information, key telephone numbers and insurance information. Below you will find information for getting started. VOAD offers information and planning materials at their Emergency Preparedness for Individuals and Families web page. In the event of an emergency evacuation, if there is a loss of communications and you and/or your family are separated from one another, decide on a safe place to meet (home, school, workplace, etc) and discuss the travel route that you will most likely use. Find a safe place to go in and near your house where nothing can fall on you. Decide on a safe place to meet outside the house. Remember how to ‘Drop, Cover, and Hold On’. Install smoke alarms on each level of your home and check (every six months) to make sure they work (Replace batteries when necessary.). Create two escape routes for your family. Pick a safe place to meet outside of the house. Have a working fire extinguisher with all adults in the home capable of operating the extinguisher. If possible, take your emergency kit with you and always have a full tank of gas (this will allow you to leave quickly). If it has been raining steadily, pay attention to TV, radio and online sources for the possibility of a flood. In the case of evacuation, make sure you take your emergency kit and always have a full tank of gas (This will allow you to leave quickly.). Anyone in Santa Barbara County that becomes displaced as a result of a local disaster including you, your family, your home and pets. The Foodbank is one of many local organizations that make up VOAD and each contributes based on its particular resources. The Foodbank provides a resource for food and water with distribution coordinated through other VOAD members such as the Red Cross and Salvation Army. The Foodbank’s two warehouse facilities can also act as logistical and communication hubs during a disaster. The Foodbank’s participation in VOAD is meant to ensure that food is available to everyone in need due to a disaster in Santa Barbara County. It coordinates both food availability and distribution logistics with other local organizations utilizing their particular strengths and expertise to create a strong and prepared local relief and recovery resource. The Foodbank’s participation in VOAD disaster relief will be based out of one or both of its warehouse facilities. Other participating organizations will have their own specific operational directives. Please visit the VOAD website at www.sbcVOAD.org for information on participating organizations.